See the world, share photos of the amazing places you visit, and get paid for the pleasure. Though to many this sounds like an improbable career path, there's a growing number of people out there doing just that and making it work. Instagram has become a veritable gold mine for thousands of enterprising travelers looking to cash in on their daily adventures. But how exactly do the people behind these successful pages manage to do what they do? Here's how. To make money from Instagram, it's essential for Instagrammers to have a large, engaged group of fans who like and comment on their content, and keep coming back for more. While some accounts explode overnight, the vast majority of successful Instagrammers have spent years cultivating this following through hard work and dedication. The first step is to settle on a niche that you love, and while travel is a niche, it's still too broad. You could use a gimmick like @muradosmann, whose hand-holding pictures created an entire genre, or @agirlandhervan, who shares all of her travel adventures in her van. The next step is to post regularly, which means once a day or more and at similar intervals. This is so followers get accustomed to seeing your content and look out for it at times when they know it will appear. 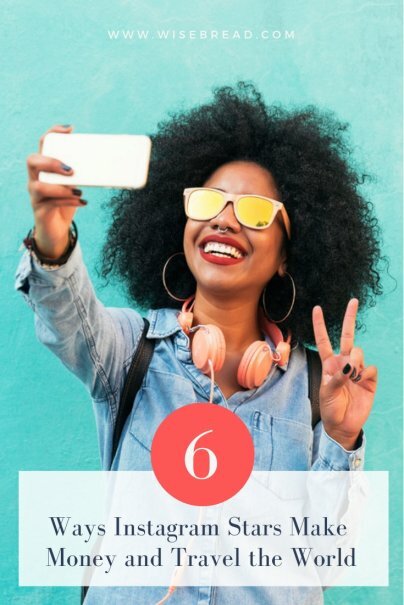 Many Instagrammers also create Instagram Stories, which are quick videos (similar to the Snapchat format) that allow them to reveal much more personality than the photos allow. Since it's a social media platform, it's also essential to be social. Particularly when building their following, Instagrammers reply to comments, like and comment on other people's stuff, and generally make themselves a visible presence on the platform. Last but not least, the top Instagrammers place a huge focus on producing high quality images. Though this doesn't necessarily mean using a fancy camera, as smartphone cameras are now high quality, it does mean posting well-composed photographs that tell a story, that represents their chosen niche, and are consistent in their look and feel. Creating sponsored campaigns with companies in the travel industry is a lucrative way for Instagrammers to monetize their accounts. Tourism boards, travel insurance providers, rental car companies, airlines, and more companies regularly organize marketing campaigns that rely on Instagram influencers. These are far easier to set up than full campaigns and tend to require a single Instagram post. Often they can be a simple review with an accompanying photo featuring the product or service. When it's a product, like a watch, or travel gear, the Instagrammer will typically keep the product in question and receive a fee on top of this for the review. Brand ambassadorships are long-term partnerships between an influencer and a brand that fits well with their niche and that naturally lends itself to their audience. They're more akin to the sponsorships that, for example, sports stars have with sporting goods manufacturers. In exchange, the influencer is bound to promote the brand regularly during that agreed upon time frame. If it's a clothing brand, for example, they will send the influencer their new collection or key pieces from it each season. The Instagrammer will then promote the new line by modeling the clothes and tagging the brand a certain number of times. Because brand ambassadorships are longer term, they're a great way for Instagrammers to build a regular income. Affiliate marketing can be done as part of a brand ambassadorship deal, or independently by the influencer through their own affiliate partnerships. Affiliate marketing programs allow them to receive a percentage of every item or service sold on their recommendation or referral. This works best with an extremely engaged and loyal following, as it depends entirely on followers immediately acting on the recommendations of the people they follow. Many successful travel Instagrammers have turned their individual model of success into its own side business. By selling their knowledge of how to make money traveling the world, other people can follow in their footsteps and use those secrets to do the same thing. This can be in the form of workshops, online courses, or speaking at seminars and conferences.